I am looking to add a power on/off switch to my winch in cab. I am looking for a wiring diagram that would allow me to add a solenoid to remotely shut off the winch via the cab so people can not short out the connections and drain my battery while I am at work. I work in downtown New Orleans so there is no telling what someone would do if they saw a winch. This is what I am thinking will work. Need to make sure before I blow something up. I'm just a big, hairy, American winnin' machine! So are you suggesting he run the main winch cable through an $8 switch and then to the battery? OP, you have it right with the solenoid but make sure you get solenoid that can handle the current the winch draws. If it was me, I'd probably just disconnect it at the battery when not in use. Yes on second thought you probably have a point there. The winch will draw a lot of power to run through a dash switch. It may be possible with relays though. I know I could do this with a relay but I am not use to using any relay that can handle 200 to 300 amps. I normally use the standard 8617 automotive relays for lights and such. What I remember, at least I think I remember from my electrical class is relays are used for short term switching as solenoids are used for longer use. Are solenoids wired the same as relays? I currently have it disconnected and plan to leave it disconnected until I go wheeling. The thing I am worried about is I will forget to plug the thing in when I go out one day and will end up with water up to my hood trying to find the plug. Honestly I'm not sure, I've never used a solenoid directly. And with my lights I normally use just a fuse and no relays. But I would still prefer to use a heavy duty constant duty solenoid. Or, if you're electrically inclined, open the winch solenoid pack and cut the small power wire that feeds the controller plug (inside the winch solenoid cover or box) and extend the wires into the cab and install a switch. However, the main 2Ga cable will still be hot at the winch. Why not just go to 12voltguy.com and buy the setup for around $50? Your idea looks good just remeber that it needs to be rated above the amp rating of the winch or it will burn up. What winch do you have? Alot of the winches come with a solenoid box and a wired remote. I just tapped into those controls and wired my own switches in cab. I have an on/off switch for the ground wire, and a temporary push button switch for in, and another for out. If youre worried about someone messing with your power cables I would install a battery cut off switch between the battery and the winch. You can get them at marine places or maybe at your local auto parts store. It would be very easy to cut the power to the winch and also very easy to turn it back on. Random Guy: "Is there anywhere that thing cant go?" Me: "Yea, past a gas station..."
This pretty much what I want to do, except I want the switch to cut all power to the winch from under the hood. I did not see one on 12voltguy.com that would do this. I also am wiring a second battery. I have been crawling the internet for the best way to do this. A lot of the kits seem to be overpriced. Apparently everyone has a completely different way on wiring up dual batteries. Just an FYI, the warn xd9000i draws around 460 amps at max load. I'm not sure about other winches, just that one because I was looking at the manual the other day. An $8 switch is typically rated at 30 amps, if that. Just from a quick search, your going to be looking at something very expensive or I couldn't find something with a high enough rating. 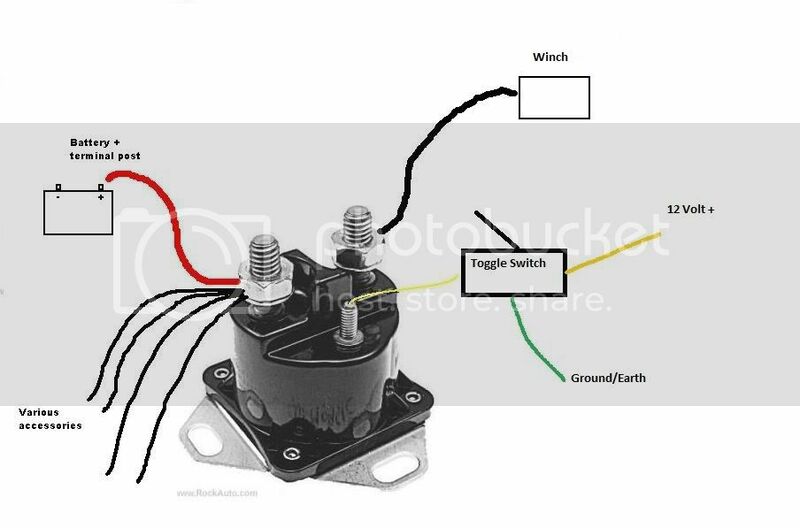 What you have is correct except the ground wire (-battery) has to go to another terminal on the solenoid if ther is one or if the solenoid is grounder through the mounting bolts your good to go. The only reason for the - to go to the switch is it has a pilot light in it. Will this also work for the winch? My winch says it peaks at 500 amps at max load. The ratting for this states : Handles 500 amps continuous and 700 amp surges.